Nothing earth shattering here. Just the sort of great radio friendly rock that should've made Lofgren a much bigger solo star. I could never understand why Nils Lofgren didn't make it as a much bigger star than he did back in the seventies, when he was mainly a solo artist. Oh sure, he was (and is) respected as all get-out by his fellow musicians. He has regularly appeared on other peoples records like Neil Young. And he eventually landed what has to be regarded as a dream gig playing guitar side by side with Bruce Springsteen and Little Steven in the E Street Band. Speaking of that guitar playing, you certainly can't fault him there either. On the current E Street Band tour for Springsteen's Magic album, one of the highlights of the shows is said to be Lofgren's brilliant playing — especially on the nights that the band pulls "Tunnel Of Love" out of the hat in the setlists. You can also find ample evidence of Lofgren's guitar slinging skills on last year's Live Acoustic DVD, where he basically puts on a clinic. But as a solo artist, his numbers have always fallen into that dreaded "respectable" category — which is basically label-speak for he doesn't sell all that many albums. Too bad. Because most of that solo work is fine stuff. I'd particularly recommend the live Back It Up, the very underated eighties album Flip, and especially — if you can find it anyway — the mid-seventies release Cry Tough. Hip-O-Select Records has just reissued Lofgren's self-titled debut album (it was originally released by Herb Alpert's A&M), and it is a perfect case in point. I'd actually forgotten how good this damn thing is. 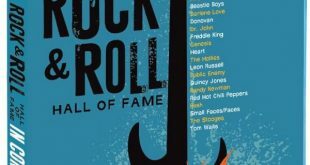 It has also got a number of songs on it you may even recognize, since some of these got a fair amount of airplay back in the days when there was room for actual rock and roll on the airwaves. Probably the best known of these are the slide guitar driven rock of "Back It Up," and the Keith Richards tribute, "Keith Don't Go," which was written as a plea for Richards not to leave the Stones (there were rumors at the time). Another song that even got some airplay on AM stations (though not many) back then, is the reflective sounding "The Sun Hasn't Set On This Boy Yet." But there are also some forgotten gems on this album. Though less celebrated than a song like say, "Keith Don't Go," the song "Rock & Roll Crook" should've been an FM rock smash with its guitar driven, made for radio hookiness. I mean its at least as memorable as stuff like Foghat's "Slow Ride" or Foreigner's "Hot Blooded" — two songs that to this day haunt my classic rock dial like something right out of the undead. Another great, but largely unheralded track on this album is the lovely sounding "Two By Two." This song, while not quite what I would call a straight-out ballad, is one of those nice, relaxed mid-tempo numbers that sounds like something straight out of Beatles territory, right around the time of Rubber Soul. In addition to Lofgren's great sounding guitar (and keyboards) here, the other two guys sharing instrumental duty on this album aren't too bad either. Wornell Jones lays down some juicy bass runs, while monster drummer Aynsley Dunbar is the more famous name. At the time this record was made, he was splitting time between Lofgren and other projects like Frank Zappa's Mothers. Eventually, Dunbar would hit the big time playing big arena rock drums for Journey. So there's nothing really earth shattering here. Just some great sounding, radio friendly rock and roll. With songs that seemed tailor made for the FM rock format of the time, it really is amazing that Lofgren didn't become a bigger star than he did. At least these days, he has the E Street Band.